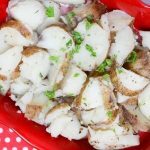 These Instant Pot Herbed Potatoes are a great side dish for so many different main dishes. They’re easy, delicious, and you probably have all the ingredients in your kitchen. Originally, I used my Instant Pot to get dinner on the table easier. It quickly became my favorite appliance so I branched out and starting experimenting with other recipes. My first breakfast recipe was a French Toast Casserole that my kids LOVED. I’ve also tried a few of my kids’ favorite side dishes. They’re big fans of my Instant Pot Corn on the Cob. 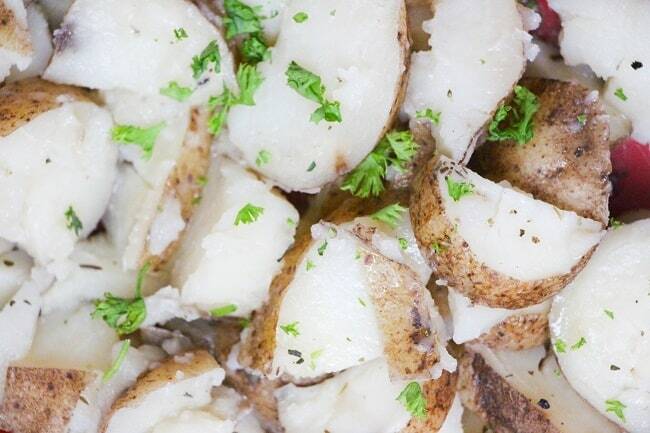 And these Instant Pot Herbed Potatoes are a close second. 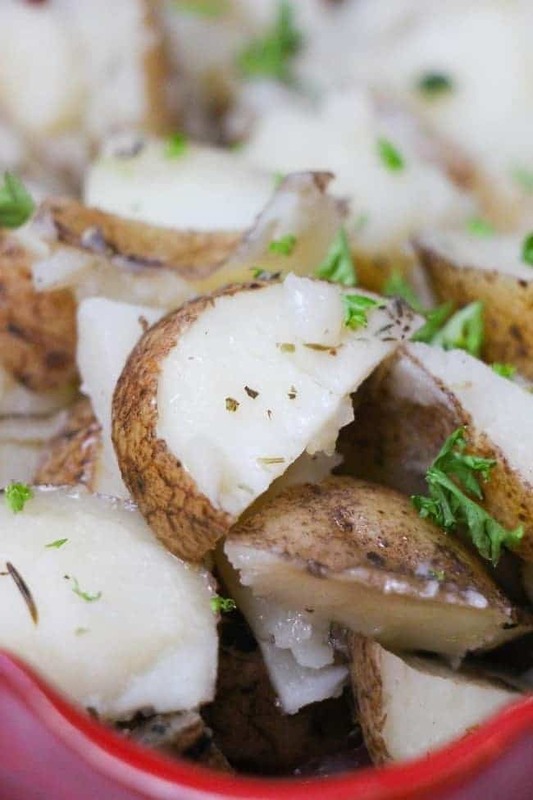 First, you’ll need to cut the potatoes into bite-size chunks. Then, add them to the Instant Pot. 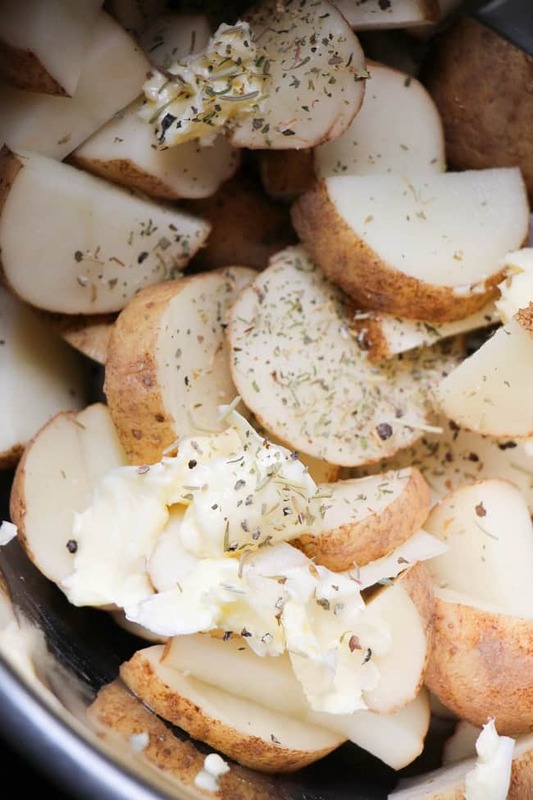 Next, you’ll add all the other ingredients that will make these potatoes delicious! Pour in the water (so the pot will come to pressure), and add minced garlic, minced onion, dried dill, Italian seasoning, and fresh parsley. Then, drop butter in dollops over the top of the potatoes. Finally, secure the Instant Pot lid, press the stew setting and cook for 5 minutes. Let the pressure release naturally for a minimum of 10 minutes. 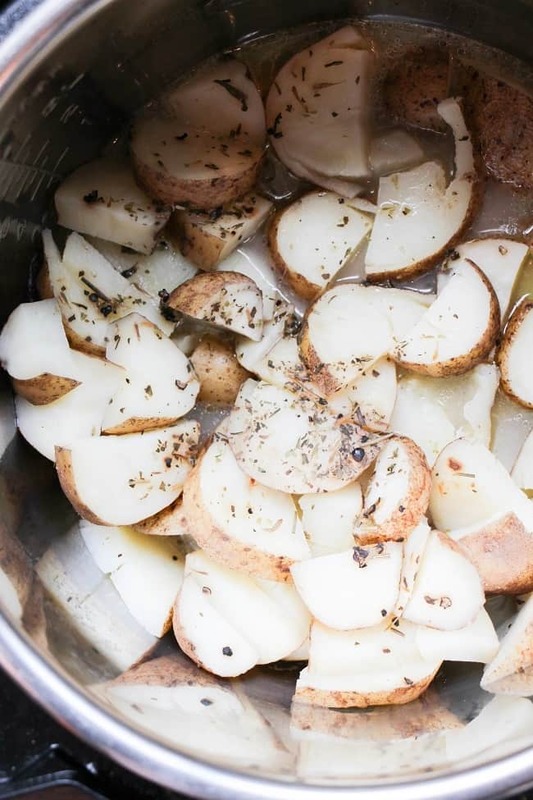 Your Instant Pot Herbed Potatoes are ready to serve! Add more seasoning before serving if you want more flavor. I like to sprinkle on some fresh parsley for color. 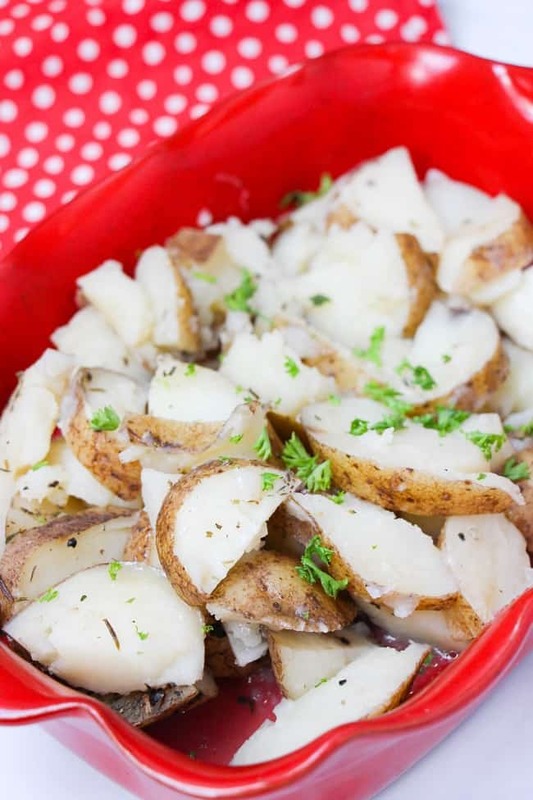 Ready to make this Instant Pot Herbed Potatoes? 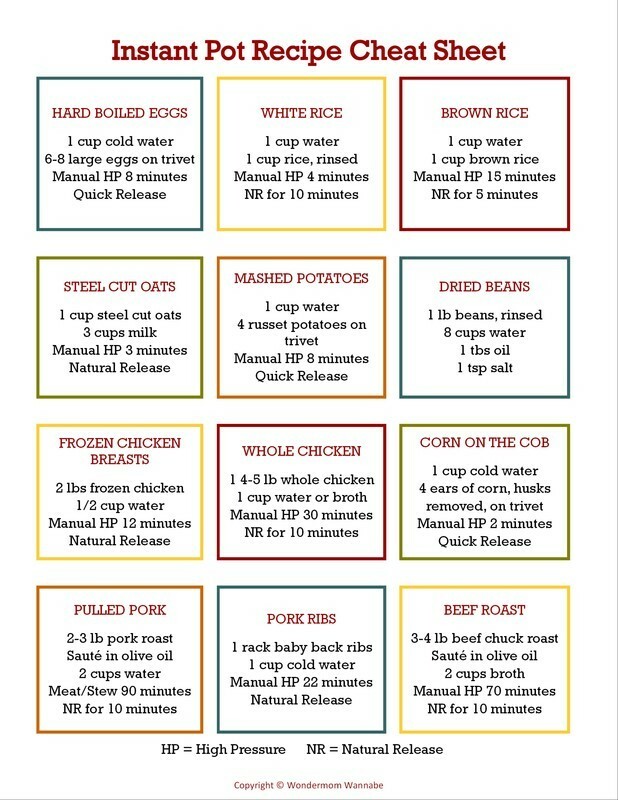 Here’s the recipe card with the exact measurements. 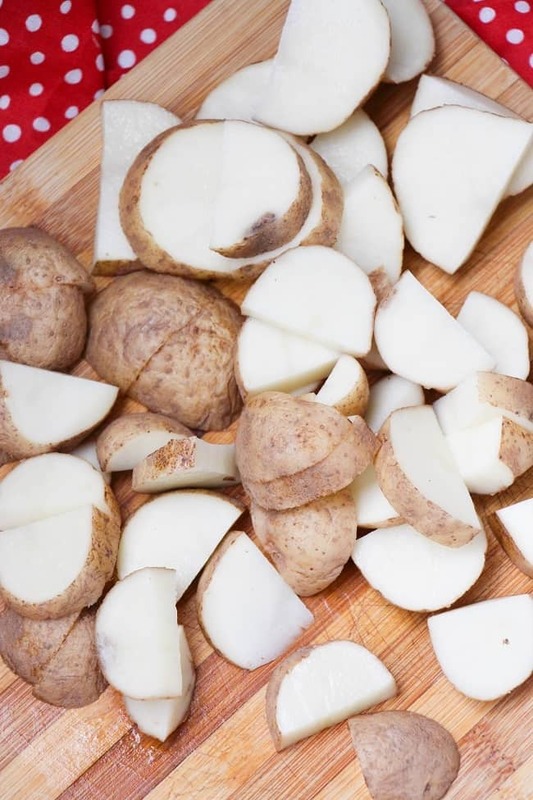 Cut potatoes in half, and then slice to 1/2" thickness. Place in the instant pot. Stir in all ingredients and then drop the butter in dollops all over the top. Place the lid on the Instant Pot, select "stew" for 5 minutes and then allow to natural release for at least 10 minutes. Taste and adjust seasoning as needed before serving. Note: if you want crispy potatoes, you can drain and add more butter at the end, select "sauté" and cook until browned, about 8 minutes. It tastes good! Potatos were mushy because I left it for half an hour but that’s the way I like it! I didn’t use any salt because I try to use as little as possible, and I put lemon juice on top – yum. I used fresh parsley, sage and this mystery herb I got at one of those little farm stands that don’t say what things are all the time lol. Maybe it’s savory? Also I used coconut oil instead of butter and it was tasty. Thank you! This recipe looks fast and delish…my only question is that I notice it’s only calling for 1/4 c. water, and I’ve always thought Instant pots in particular require 1 cup minimum (or you get the dreaded “burn” message error!?) Also what if I’m cutting the quantity down, do I further cut the water? The butter melts during the pressurizing process to make sufficient liquid for the pot to come to pressure without triggering a burn error. Any more liquid and the potatoes get mushy. That being said, if you reduce the amount of potatoes, you won’t want to reduce the liquid since it will not be sufficient to come to pressure. In fact, if you cut the recipe in half, you might want to increase the water to 1/3 cup (since there will be less butter) and set the potatoes on the rack that came with your pot to prevent the bottoms from sitting in too much liquid.